IRBY, FRANCIS GERALD [JERRY] (1917–1983). Jerry Irby was a country musician, recording artist, and composer. In a career that spanned almost forty years, Irby played guitar in various Texas bands, vocalized, wrote many songs, and recorded for at least ten labels, including Mercury, Imperial, MGM, and 4 Star. He was born, according to his state-issued birth certificate, Francis Gerald Irby in Sabine County on October 20, 1917. Twenty years later he joined the Bar X Cowboys, a top-notch Houston group. In the late 1930s and early 1940s, Irby also worked with the Texas Wranglers (not to be confused with the Tune Wranglers), another Houston-based band that included the legendary steel guitarist Bob Dunn and vocalist-guitarist Dickie McBride. 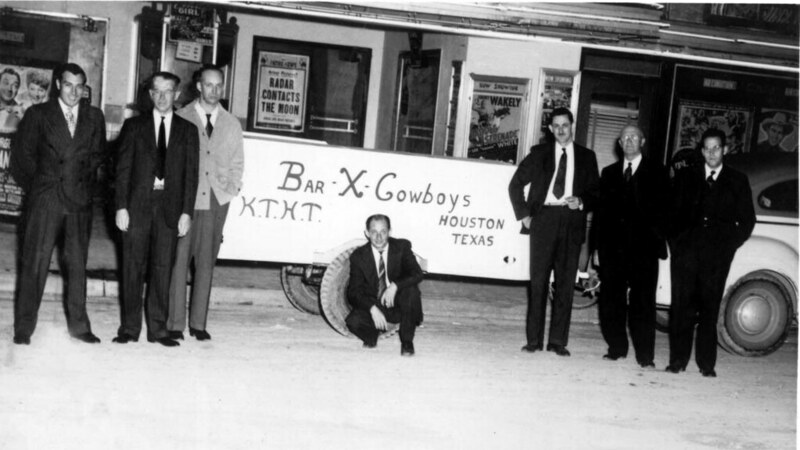 Bar X Cowboys, with Jerry Irby pictured third from the right. Image available on the Internet and included in accordance with Title 17 U.S.C. Section 107. From left to right, Leon Payne, Hank Williams, and Jerry Irby. Courtesy of the Houston Press. Image available on the Internet and included in accordance with Title 17 U.S.C. Section 107. Daffan Record, "Clickety Clack" by Jerry Irby and The Texas Ranchers. Image available on the Internet and included in accordance with Title 17 U.S.C. Section 107. The recording ban of 1942 essentially shut down recording activity for more than two years. During this time, Irby’s professional activities were largely confined to appearances with other Texas bands, notably those of Ted Daffan and Dickie McBride, and with fronting his own group, the Texas Cowboys, aka the Texas Ranchers. Jerry Irby is best-known as the composer of the 1946 hit, “Drivin’ Those Nails in My Coffin.” He first recorded his song on Bill Quinn’s Gulf label in Houston in 1945. The tune became a regional hit and caught the attention of other performers who successfully covered it—namely Floyd Tillman (whose version hit Number 2 on the country charts) and Ernest Tubb (who reached Number 5) in 1946. In 1947 Irby was signed by MGM to what proved to be a short-term contract, curtailed by yet another recording ban. He then took a fling at the nightclub business and in 1948 opened a club at S. Main and Old Spanish Trail in Houston. Known as the Texas Corral (or Jerry Irby’s Texas Corral) with a reported capacity of 1,000 patrons, the establishment featured Irby and his Texas Ranchers three nights a week. The other nights were split between Floyd Tillman’s band and Leon Payne’s group. Irby sold the business in 1950, and by 1953 the Texas Corral was renamed the Paladium. During the late 1940s and into the 1950s, Irby recorded for a succession of small regional labels and ventured briefly into rock-and-roll on the Daffan label. Following a long period of inactivity, he returned to recording in the early 1970s and made several albums of inspirational songs for the Bagatelle label. He died on December 2, 1983, possibly in Jackson County, Kentucky. Andy Bradley and Roger Wood, House of Hits: The Story of Houston’s Gold Star/SugarHill Recording Studios (Austin: University of Texas, 2010). The Early Houston venues (http://scottymoore.net/houston.html), accessed October 12, 2011. Adam Komorowski, Liner notes to Doughboys, Playboys and Cowboys: The Golden Years of Western Swing, Proper Records, 1999. Al Turner, Liner notes, Jerry Irby (Collector, 1993) available on Bopping (http://www.bopping.org/eng/?p=210), accessed October 10, 2011. Handbook of Texas Online, Nolan Porterfield, "IRBY, FRANCIS GERALD [JERRY]," accessed April 24, 2019, http://www.tshaonline.org/handbook/online/articles/fir11. Uploaded on May 19, 2015. Modified on April 10, 2017. Published by the Texas State Historical Association.